By the time you read this, we will be going to the dogs! More precisely, the dogs will be coming to us, about a thousand of them, as March 6th, 92 sled dog teams are set to leave Anchorage for the annual 1,200-mile Iditarod trek to Nome. It’s a period of long work hours for everyone on the staff, and a time when our listenership is especially high. Thank you for making our work possible. We pray in thanksgiving for your generosity. DANCING: Young folks had a lot of fun in the Yup’ik Eskimo village of Stebbins, as they present a traditional dance. In the heart of KNOM listening country, the community of 570 is an hour’s plane ride southeast of Nome. The performance was part of the annual Stebbins Dance Festival, held to teach customs and traditional values and music to youngsters from throughout the region. KNOM volunteer Anna Dummer spent the better part of a week in the village, and you’ll find her story on pages two and three.Among KNOM’s objectives, we encourage youth to learn the rich traditions of their past. Most hours, we play one traditional drum dance song, and trips like Anna’s are refreshing our Eskimo music library with new material. ALMOST TWENTY: By the end of March, Nome’s normal high temperature is up to +19�! Please remember missions like KNOM in your will. We prayerfully place all bequests into funds that provide for future major improvements, and protect the mission from unforeseen emergencies. INSPIRATIONAL SPOT: When you start to light a fire, you’re bothered by the smoke in your eyes. They water. But in the end, the result can be a nice, warming fire. God is a consuming fire. We must first light this Divine fire within us, through tears and with struggles. I’m sitting here with my second mug of hot chocolate, trying to decide how to describe the Stebbins Dance Festival I covered last week. It’s hard to put into words what it’s like to experience the gathering of school groups from eleven different villages for the purpose of dancing and teaching traditions and values. I flew to Stebbins Wednesday night to be greeted at the airstrip by the airline agent for a truly arctic ride to the elementary school on the back of his four-wheeler. School was out for the day and administrators and teachers were trying to empty the school of Stebbins kids so that visiting students could settle into the designated classrooms where they would be spending festival nights. I carried what turned out to be the easiest way to meet kids ever: the station’s mini disc recorder. This box, the size of a large book, would prove to overcome any hesitancy on a child’s part to come up to a stranger and stare. I sat by myself at the end of a table trying to remember how to use the contraption in order to record hours of traditional Eskimo music. Within five minutes I had a group of kids asking what “that thing” was. I don’t know if it holds true for 6-year-olds everywhere, but these kids sure were entertained by saying their names and listening to the disc play back again, and again, and again. By the time the welcoming ceremony was to start I was well versed in how to record, rewind, and play back. As the event began, visiting kids paraded into the gym and sat on both sides, leaving enough room for the dancing. Stebbins drummers played for three hours and there was spirited dancing. Each dance tells a story. Having been raised in a very different culture, I was fascinated. The rhythm of the drumming and the intricate movements of the dancing were truly incredible. When the dancing ended, the gym was transformed into a sleeping space for the boys and the school emptied of community members. Did this mean that the students were getting ready for bed? Of course not! Bring together about 100 kids from villages all over the bush, get them dancing, give them a snack, and expect them to sleep? Part of my responsibility on this trip was to call in news stories each day, so I was down in the commons trying to put something comprehensive together. This turned out to be the best procrastination technique that I’d ever found. I only wish I had had the mini disc back in college! Far easier to justify than watching a movie, I recorded about two hours of talking with the kids and how excited they were for the next day’s workshops, how happy they were not to be in school, and, sometimes, how nervous they were dancing. After a final light’s out from the chaperones the kids started drifting back to their assigned rooms, or the gym, and I finished up and went to bed. 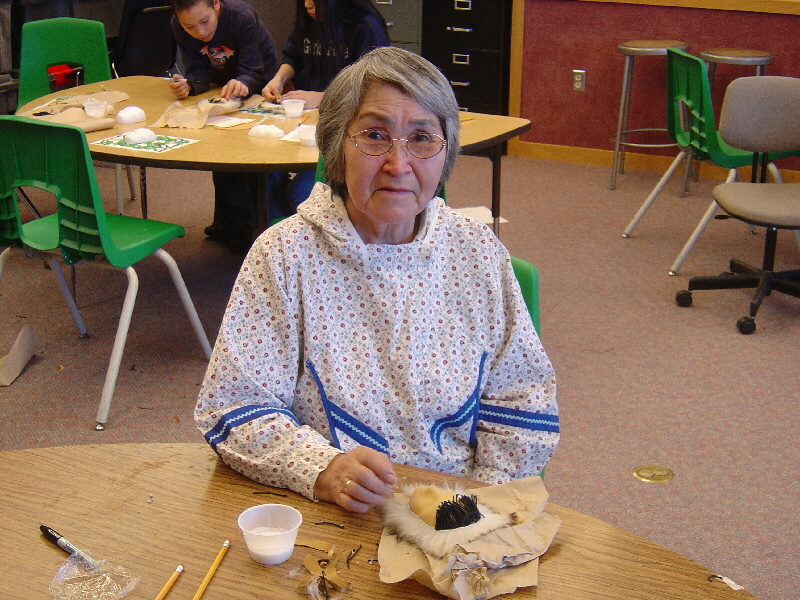 The next day brought a whirlwind of walking around to different workshops, among them, beluga whale net building, soap carving, mat weaving, mask making and beading. Another session taught how to make an Eskimo dessert called agutuk. Pronounced “ah-GOO-duck,” it’s a mixture that usually contains shortening, sugar, tundra berries, and perhaps seal oil and shredded fish. Despite how it sounds, I found it delicious. Participation in the soap carving workshop proved to be great for two reasons: it provided some good pictures and material for my next story, as well as a bar of soap in the shaky design of a flower for me since I had forgotten mine back in Nome. The Native Youth Olympics workshop was my favorite. Seeing someone leap up off one leg, kick a high leather bag, and then land on that same leg is incredible. Other NYO events include balancing on one arm and then reaching up with the other to hit a leather bag, hopping down the floor in a push-up position as far as possible with the head always being highest point , and placing a leather ring around two sets of feet facing each other, rising up into a crabwalk position and trying to pull the other person off balance. After the workshops, students had some downtime to go to the village store, rest, walk to see the local reindeer herd that was on top of a nearby hill, or visit with new friends. Come 7:00 everyone was back and ready for the dancing to begin. Each school got time to perform as many and whatever dances they wanted. Some schools did local dances, some did dances learned from other regions, and some schools performed new compositions. Between the school performances and common dances that wrapped up the night I had about four and a half hours of great material. On the last day of the festival, nobody wanted it to end and the dancing ran far into the night, so long that I ran out of both sets of batteries I had brought and almost ran out of space on the disc! The next day saw tired and sad faces packing and getting bundled up to head to the airstrip for the trip home. As I took my turn on one of the villager’s four-wheelers I reflected on the incredible experience I had just enjoyed. And on the work that lay ahead of me, editing dozens of hours of Eskimo music to be played over KNOM for many years to come. Lord, grant that I may fish until my dying day. That in Your Mercy, I be judged big enough to keep. MASKED WOMAN (left): Cecelia Mike from the nearby village of Kotlik teaches children to make masks using modern and traditional materials at the Stebbins Dance Festival. THIRTY YEARS AGO: In March 1974, KNOM sent a reporter along the Iditarod trail for the first time. Volunteer news director Steve Havilland followed the second running of the 1,200-mile race by small plane across some of the most remote and uninhabited parts of Alaska. There was no secretary to assist with correspondence, and former KNOMer Carol Razewski returned for the month to help out in the office. COUNTING UP: Since January 1st, KNOM has broadcast about 8,500 inspirational spots, and an equal number of educational ones, most produced here at the station. Thank you for making our work possible! Thank you once more for your care and concern for us and for our work. We keep you in our prayers, and we are sincerely grateful for yours, and for your financial helping hand, which allows us to pay our bills each month. May God richly bless you and those you love.